Remember this quilt? These colors always felt beachy to me, so I figured it was only right to take photos of it at the lake. 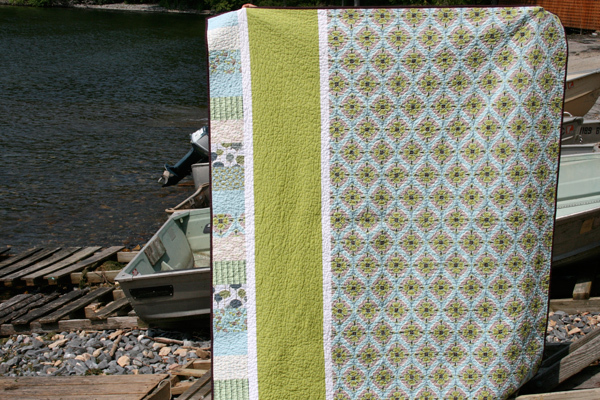 This one is made from Jessica Levitt’s Timber line in the breeze colorway. The pattern is my take on the quilt pattern used in Randi’s ‘On the Road to Spring’ quiltalong. I changed it up a bit by altering the size of the rectangles, adding in the thin white strips on either side of the solid green squares, and adjusting the placement of the blocks. I always had it in mind to bind it in the same green solid that’s used throughout the quilt, but as I was quilting it I kept thinking about purple instead. One of my favorite Kona solids is Raisin – I pulled a piece out after I was done quilting it and was pleased to see that the raisin went quite nicely! The solid green fabric is Moda Bella Pistachio and the binding is Kona Raisin. 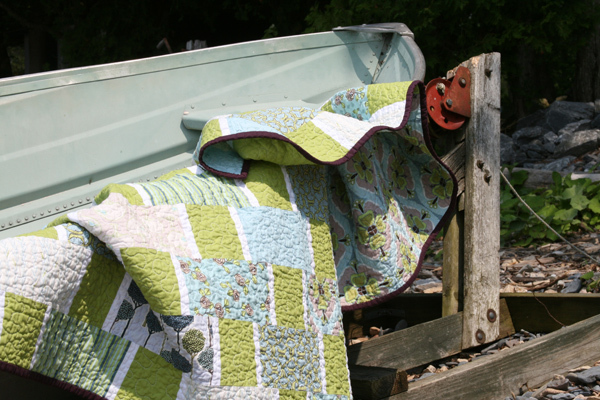 This entry was posted in [search] Other Quilts, 2010 Finished Quilts, Finished Quilts, Posts about Quilts, Quilts and tagged handmade, jessica levitt, on the road to spring, quilt, quiltalong, quilting, timber. Bookmark the permalink. i like this simple patchwork. good job! I love this one! I might use that fabric to do something for my bedroom, it’s very relaxing looking. That is really cute. I am going to bookmark this so I can make up something like it too. Probably for QOV. I love this one!! 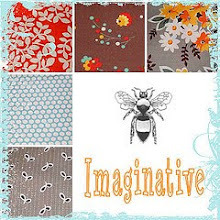 I love the fabrics, I love the way you did the backing, I love the colors. You are so talented!! I am loving your work! This is really pretty. I love the one X looking fabric on the front that is used for the backing as well. 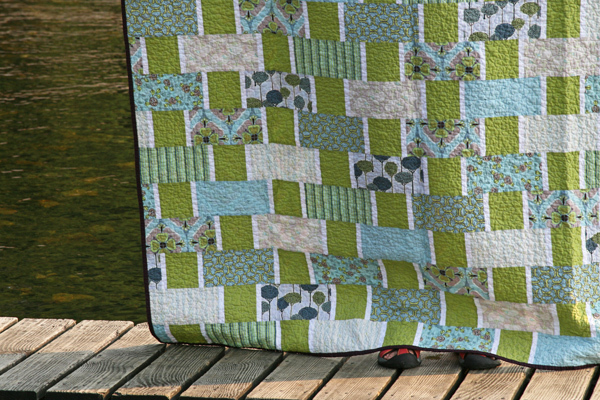 That design gives the front of the quilt some special pizzazz, doesn’t it? The back is fabulous! The addition of the little white strips and the raisin binding is a perfect variation. Looks great, makes me want to go find that tree fabric that’s in the Timber’s collection! This is an interesting pattern and I love the fabrics that you used with it. Lovely job! Really love this one! One of my favorites of yours this year! Super gorgeous! I love it! The raisin binding was a really great idea! I wish! Just fortunate enough to get to go to the lake on the weekends…. during the week I’m stuck at a regular job. I really like the impact that Raisin packs along the edge. Beautiful! I love the raisin binding! I have some Timber waiting to be used. I love the Pistachio and Raisin solids you have teamed with it. A beautiful quilt and lovely setting to showcase it. ABSOLUTELY BEAUTIFUL! I just LOOOOVE IT Ashley! Very nice I love the fabric. It looks like a cool tree in the background with the prints! Very eye catching! I like that quilt. That is gorgeous, both front and back! And you’re right – it’s very beachy!! 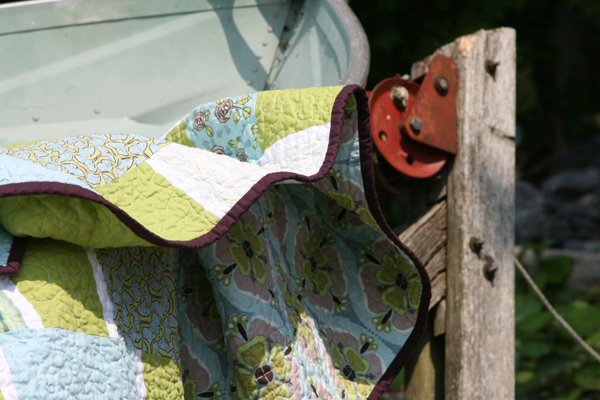 The purple binding really “makes” the quilt – I love it! I was wondering when you’d finish this one….I had saved the picture of the top and was planning to do something similar with some Nicey Jane and some seafoam 🙂 Looks great- hope my version goes as well! Love the Raisin. I love it. Front to back, it’s just awesome! The raisin border really sets it off. Well done! 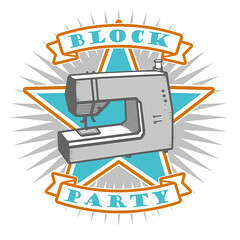 Hi… I love your quilts, and I get excited when I see a post of yours in my bloglines! I have a question 🙂 I am a beginner quilter and I love pieced backings. I would like to try it next but I am wondering if you have any tips on getting the backing straight when you cant see it when basting. Do you have any other pieced backing advice also? I think binding in it in a raisin color is the better choice, that way it pulls out the purple/lilac colors that are in the flowers. My favorite part is the back of the quilt. The very strong linear “swaths” always grab my attention. I am sure someone will buy it and lovingly put it in their lake house. I love those thin white strips in between the prints. And I adore that Raisin fabric for the binding! Might have to order some of that color. Great quilt! 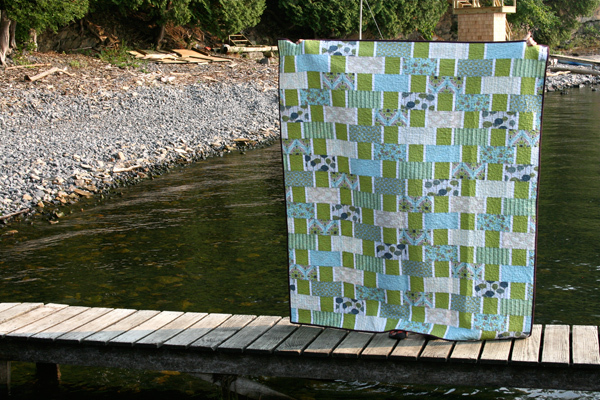 I love this quilt, I think I may try it with some fabric I have set aside. However the fabric that would take the place of the green squares is a pattern. Not sure how that would turn out. Do you by chance have the size of your squares, rectangle and strips?? I really like the sizing but I have a feeling I would be cutting many random sizes to get it right. I know this quilt was done a long time ago but if you happen to be able to tell me I would be most appreciative.